What Did Bank CEOs Know And When Did They Know It? One view of executives at our largest banks in the run-up to the crisis of 2008 is that they were hapless fools. Not aware of how financial innovation had created toxic products and made the system fundamentally unstable, they blithely piled on more debt and inadvertently took on greater risks. The alternative view is that these people were more knaves than fools. They understood to a large degree what they and their firms were doing, and they kept at it up to the last minute – and in some cases beyond – because of the incentives they faced. New evidence in favor of the second interpretation has just become available, thanks to the efforts of Sanjai Bhagat and Brian Bolton. These researchers went carefully through the compensation structure of executives at the top 14 US financial institutions during 2000-2008. The key finding is that CEOs were “30 times more likely to be involved in a sell trade compared to an open market buy trade” of their own bank’s stock and “The dollar value of sales of stock by bank CEOs of their own bank’s stock is about 100 times the dollar value of open market buys” (p.4). If the CEOs had really believed in what their banks were doing, they would have wanted to hold this stock – or even buy more. Disproportionately more sales than purchases strongly suggests that the CEOs felt their stock was more likely overvalued than undervalued. The problem runs deeper, as Professors Bhagat and Bolton explain. Given the compensation structure of CEOs – particularly the fact that they can sell stock with very little restriction – they have an incentive to take on excessive levels of risk. When the outcomes are good, as they may be for a while in an up market, the CEO can turn his or her stock into cash. When the outcomes are bad, the CEO doesn’t care so much because he (or she) already has cash – and some form of government bailout or other support may be forthcoming. Bhagat and Bolton argue that if this incentive problem is important, we should see CEOs make a great deal of money while long-term buy-and-hold shareholders lose money. Table 4 in their paper shows the amounts of money involved, and they are simply staggering. Collectively the people who headed these 14 institutions pocketed – in hard cash terms – over $2.6 billion during 2000-08. It’s true that the paper value of their wealth dropped in 2008, although this was an unrealized paper loss. But even including that notional loss, the CEOs netted an impressive $650 million. In contrast, long-term shareholders in these 14 banks did very badly, particularly in 2008 (see Figure 1 in the paper). Bhagat and Bolton show that shareholders in the biggest banks – where CEOs got their hands on more cash – did significantly worse than investors in smaller banks. Interestingly, CEOs in the smallest banks in their sample did not sell much stock relative to their purchases of their own bank’s stock. The big bank-small bank contrast is quite striking. This points the authors towards moderate but appealing changes in executive compensation practices. “Executive incentive compensation should only consist of restricted stock and restricted stock options – restricted in the sense that the executive cannot sell the shares or exercise the options for two to four years after their last day in office” (p.37). The authors are very much on the same page as Professors Admati, Demarzo, Hellwig, and Pfleiderer (and many others in the finance profession), with regard to our need to increase the equity financing of all banks. This recommendation should be taken on board by all shareholders and their representatives. But who designed and negotiated the compensation packages at issue here, and who is in charge going forward? The executives in question hire people like Steven Eckhaus, a top Wall Street compensation lawyer, who puts up a spirited defense of current practices and insisted the Wall Street Journal just last weekend that “to blame Wall Street for the financial meltdown is absurd” (p.B13 of Feb.5-6 print edition). There is no sign that financial sector executives making decisions at our largest banks – and supposedly acting in the interests of shareholders – are at all interested in being compensated in a more responsible fashion that would better protect shareholder value. They want to get the cash out at every opportunity. Boards of directors comply; the breakdown in corporate governance in this respect is complete. The only fools here are the shareholders – and the rest of society that buys into such a foolhardy scheme. This entry was posted in Commentary and tagged CEO compensation. Bookmark the permalink. I don’t understand – if I worked for a company I “believed in” and was paid in stock, I’d still be selling the stock and not buying it with my cash, in order to diversify. If I put all my eggs in one basket, if something unforeseen happened to my employer I’d lose both my job and my investments. Surely the right experiment is to pay bankers in cash, and then observe which stocks they buy? It’s a bit odd to complain about bankers taking daft risks, and complain about them behaving perfectly sensibly w.r.t. diversification. You do not need to know anything about what bankers did with their own stockes to understand that they were well aware of what they were doing in the subprime market. Any idiot in any finance company in the world knows that when you play change LTV and DTI factors, failure rates increase. Issuing securities that ignore that simple fact is clear cut evidence of their awareness. Thanks for sharing this information. I realize now – too late – that I bought into this giant Ponzi scheme. Simon Caulkin lists some of the reasons I was given to justify it: http://bit.ly/ej6tbx besides ‘Free’ Markets. That is some gorry photo there freedom, And from the looks of it they only need a hand and some teeth to bark out what ever it is they are mad at. And Louie, in the name of corporate games, he who has the most stock, runs the company, giving incentive to hold stock, and belief in the company both at the same time. And yes there are obvious risks, but they have been allayed over time for whatever reason. Looking for answers? The first place to look is at what motivates the action. You will frequently find a monetary benefit. So begin by following the money. I held once held shares in the company I worked for – a (so called) Dotcom company. I lost my job and lost £thousands. But I learnt a lesson – always diversify. These bank CEO’s only had to know one thing – the future is uncertain. Exactly. Employees who receive any sort of payment in company stock (whether they are an Exec or a junior employee) should always convert it into cash as soon as is practical. These guys would short their own mother. I am sure there is plenty of evidence that the bankers knew exactly what they were doing, and that the “music” would eventually stop, however, the existence of these sales can merely point to the executives monetizing their non monetary compensation, so that they can invest it in other ventures and spend it on yachts and villas ans such. As much as they might believe in their banks, they might see even better returns available in other speculations. It is simply akin to cashing their paychecks so they can spend their money down at the track and then the pub. It might be more interesting to try and find out how many of the banksters were actively shorting their own industry and clients, betting against its collapse, etc. Yeah, if you already have a few hundred mil in the bank(switzerland), an extra 50 mil is not as important as is Covering Your A..
Oh, then making the US Govt. pick up the pieces. Then having your man in the FED give you free money to ‘invest. Oh, then lobbying to make sure no one gets caught. All 2 million of them. Investing in the banks, particularly in the former investment banks, has always been a suckers’ game … they are run by and for the benefit of managers. The authors should have tallied up the cash bonuses + liquidated share values of managers vs. “profits” reported per share (ostensibly what shareholders are discounting to present value when they buy shares) to really see where the money’s going. Heelllooo….we need different banking model. May I suggest considering the solutions outlined at http://www.public-banking.com and http://www.monetary.org. Many people want to believe that radical change is, in and of itself, a frightening thing. But some of us know that the definition of insanity is doing the same thing over and over, and expecting different results. To counteract the charge that the bank execs were simply diversifying their holdings, the rates at which they purchased and sold stock should be compared to other industries. I doubt the executives of Colgate or Proctor and Gamble are 30 times more likely to sell stock as to buy it. I think we could about more than just the bankers if we looked at more companies. Did execs of homebuilder companies sell more stock? I’ve worked for a private company for 15 years and have no opportunity to participate in its long term growth. If I had the chance I would have been buying shares every year I worked here and my earliest purchases would be worth 10x what I paid. Given the opportunity, I would have put money in. Given a similar choice (take a short term payout or leave the money in and participate in the long term growth of the bank), the bankers chose overwhelmingly to take the money out. Why? Because they had no faith in the banks’ long term prospects. Yep…keep defending your Bank CEO’s, you sorry bunch of “Wanna-Be-Oligarchic-Dolts”! PS. We all know what happened to Ken when his conscious…the dark-side of ones’ shadow catches up with that subsequent twilight of “Dawn”? Diversification. Simon’s argument holds no weight. FDR had it right when he separated investment and commercial banking. The investment side is too mercurial to effectively regulate, and so it should be limited in its scope and allowed to live or die by the impartial rules of pure capitalism. Sadly, many of the investment banks now qualify as bank holding companies and can get easy money at the Fed window. If only Obama took a page or two from FDR’s playbook instead of Lincoln’s. Nope. Sorry. Obama prefers to serve “organized money”. Sorry, but this is a very superficial analysis. EVERY executive who has a big equity component to his/her comp plan sells way more stock than they buy in the open market. They are simply executing a rational diversification of their personal portfolio since their current income and probably most of their net worth is tied to the fortunes of the company. Any sane person in their position would do the same thing. What would have been interesting, and actually add some value to the conversation, would have been to compare the selling by bank executives with the selling by executives in other industries. Otherwise this is a typical clueless academic exercise and a dog bites man story. The only effective way to control the agency risk that banks bear with respect to the behaviors of their employees is to make the employees who commit the bank’s capital to a particular instrument put a meaningful portion of their own worth in that instrument. That is effectively what happened in the old partnership model on Wall Street and those firms did a much better job managing risk – they kept a very close eye on what their partners were up to. Do that and you won’t need 100 egg head economists debating who is systemic and when they have crossed the line and a whole additional layer of regulation that will likely prove ineffective in the next crisis anyway. That’s a scary unemployment graph video, @10% and the entire country turns black. This is a good illustration as to why I argue against one-size-fits-all governance in favor of segmented domains that are consistent with the underlying economic environment. Primary factors for forming policy to deal with complex economic and financial problems created by change are the measurement and management of: predictability as to known knowns, risk as to knowns and unknowns, and uncertainty as to unknown unknowns. Uncertainty is quite different from predictability and risk. Serious errors stem from treating them as the same. A rarely identified factor that stands as a constant obstacle to the effective and efficient financial management is the relationship of the component parts – predictability, risk, and uncertainty – to the connective concept of randomness. Your statement may be true, but once a segment of the economy has leveraged itself so very few are in control of the majority of so called wealth, the only equalizer becomes a one size fits all. Try as they may, the very few become outleveraged with sophiscated tools that most don’t, and only a couple of the remaining few, understand. But the very few know how to control what they have by circulating what money they can around the globe and juggling their schedules around it. Surprises (like Egypt) spring up overnite and you find yourself bailing on the connective concept of one size fits all, and then your world falls apart in a burst of rage. This is a conceptual non sequitur. Markets are complex adaptive systems. If there is complexity, there is uncertainty. How do you propose to govern deterministic risk and indeterminate uncertainty with OSFA metrics? It is like have one set of driving regs for the US and UK. If you are arguing in favor of the continuation of the current OSFA legacy governance how do you correct the troubling, non-linear trend of larger and more frequent boom-bust cycles. To illustrate, the Crash of 1987 experienced a $1 trillion decline of wealth. Fourteen years later, in 2001, the Dot-com Crash witnessed a decline of wealth of $4 trillion. Seven years later, in 2008, the Subprime Crash saw an $8 trillion decline of wealth. I argue that this underlying trend is caused by the conflation of risk and uncertainty resulting in non-correlative information. Bottom line is that bad data mined by bad tools result in bad policy. Yea, I dig your numbers, I prefer to burn the papers, swipe the landscape clean of its garbage, start over from scratch, and reduce the uncertainty. Now since you have not seen the light of the sun for anymore than say 50 years, I can understand where you are comming from, but not where you are going. Having worked for a few public corporations, my experience is that CEO’s (and anyone with a “C” letter in their title) tend to surround themselves with yes-men and like to build walls between themselves and the troops on the ground. That way they can maintain “plausible deniability” if the worst happens and they find themselves testifying in front of a jury or Congress. So of course these guys knew what was going on, but they made sure that there would be no paper trail connecting them to their misdeeds. Certainly Enron and Worldcom taught them a few lessons. The simplest solution would be to let stockholders vote on CEO compensation. Much of the problem here is that boards of directors do such a poor job of representing shareholders. We’ve been down this road before. You can’t “align” CEO and management interests with those of shareholders by comping them with stock. Period. I’m a great guy, ask my wife, but if you comp me with stock I will sell as much as I need to in order to feel secure etc. I would expect a high sell/buy ratio when stock holdings are constantly refreshed with option grants, as the grants vest. When you incentize people with stock, you give them incentives to drive the stock price higher through any means. Maybe you combat this with deferred vesting and hadncuffs,clawbacks, etc. I doubt it. Contrast this with a privately owned company. The contrast is even clearer with a closely held company. It is the continued existence and viability of the company that secures the future of its owners who are typically also board members and management. The problem is inherent and intractable in the publicly owned company. Ownership is too diffuse to actually control the board, and professional managment adds another conflicting interest to the mix. You have to look well past compensation schemes to find professional management and an outsider board that has the same interest as long-term shareholders of a public company. You need to call in the psychology department to make it work. This study, as presented, strongly suggests that the primary fiduciary obligation to the shareholder was not exercised. Furthermore, it appears that the CEO’s pecuniary interests assumed such primacy. Is this not a basis for a class-action shareholder lawsuit? Or must they go to arbitration first? Never mind the implications of possible insider trading. Yeah – like I’m sure the SEC is all over this (Can you say “regulatory capture?” – Sure you can.). Bingo. The agency problems inherent in public companies are intractable. The interesting recent development is not the massive CAGR of exec comp that gets a lot of ink, it’s the absurdly short average hold times for share purchase (i.e., now measured in the seconds). Uh, CEOs are (partially, usually handsomely) paid in stock. Why would they buy more, except as a PR stunt to show “confidence” in their own companies? I skimmed the article, as far as I can tell, the authors didn’t bother to compare these CEOs to other industries to see if this 30x ratio is something unique to Financials. I just did a quick look at J&J, a generally highly regarded company. In the last 2 years (only data I had), the CEO has sold 240K shares and purchased none. HE MUST KNOW THAT J&J IS GOING DOWN!!! Show me the CEO who sold every share vested share. Then you might have something interesting to say. As anyone can see Simon Johnson insists in ignoring that it was the regulator who authorized the banks to leverage 62.5 times to one whenever it lent or invested in anything related to a triple-A rating… and which meant that a mere 1 percent margin could be catapulted into a return of bank equity of 62.5 percent a year…. As if Simon Johnson would not have picked up that return if offered a chance… As if Simon Johnson, after picking up that return would not have said to himself… “This is crazy and absolutely not sustainable… I better get out”. It seems like Simon Johnson would prefer to have our banks to be managed by bankers stupid enough to want to lose their own money. Thank you for writing up this disparity. The numbers don’t lie. This isn’t about “diversication” because it’s not about individuals. It’s about the significant difference, in the aggregate, between small and large banks. There’s correlation between size and the relative success of CEOs and shareholders. Does it make a difference? It should to investors. And if it weren’t for the extreme distortion brought about by TBTF, it would. Simon’s argument seems a bit weak to me, but all of the arguments against seem just as weak. The desire to sell must be in context of the rest of your total wealth and total income. Why sell for diversification if the stock is just a minor portion of your existing portfolio? You’re already diversified (or as Peter Lynch says “diworsified”). Why sell if the stock is a minor portion of your income? Simon, I love your article. It is well written, well supported by the facts, cogent, and spot on. And, as always, the praise I give is both justified and admirably earned. You’re my man. Delightful logic and rationale. Sadly, though, you can’t take that to the “bank” like the lies and obfuscations foisted upon us by these massively over-compensated executives and their handmaidens on Capitol Hill and their also massively well-compensated legal scions. To do what these Wall Street executives do, all admittedly bright and mostly well-educated, it takes a lot more than brights, a plan and luck. It takes control. It takes a healthy amount of lieing, stealing, and cheating. It takes lots of rules writing and underhandedness. It takes clout, lobbyists, campaign contributions, and lots of friends in high places. At all of these things, they are as crafty as the best Stadivarius employee on his best day, with great wood, and lots of time. They are all of these things because they are the leading oligarchs participating in the largest rent seeking scams in an absolute plutocracy which outstrips anything ever seen on this planet. And, although they are mostly American citizens, it is not easily determined. They only salute this country when they pray to the dollars. And, now that QEII is enabling them to re-bubblize, they are doing it with endless enthusiasm and acumen. Egypt’s current problem is their doing, as much as anyone’s. It used to be that Egyptians earning little more than $2 a day, could actually feed themselves, but once the big boys on Wall Street finiahs creating their commodities bubbles, even Americans making $60,000 a year may find it hard to feed themselves. But then, before that happens, we will have another giant crash. We don’t know from where, but there are lots of choices, and the cheerleaders on CNBC may find it hard to raise their pompoms when it hits. Actually, Per, considering what a loyal blogger you are, you know that all Simon wants is for bankers to be bankers, not crooks, not borrowers and lying scammers, but real bankers. You know, the kind who, in the famous words fromt the old Smith-Barney commercials “earn” it. No one who makes more than $10 million a year really earns their money, with minor exceptions. Certainly you are right that they aren’t the ONLY ONES TO BLAME, and Simon will readily say that. But, once they paid off enought folks to get Glass-Steagall out of their way, it was game on. If we make bankers of them again, the rules will constrain them appropriately. You do remember how their stock was continuously progressing during that period don’t you? If they believed that the game would go on for a long time, they would have been well advised to buy much more than they were given, wouldn’t they? They could afford large purchases, after all, and their large purchases would have caused the stock price to increase even more, wouldn’t it? And then they could have done the averaging which creates greater security for the holder, couldn’t they? But, they knew something, didn’t they. Why else would they spend so much on buying insurance? And, I bet not one bought any stock in AIG, did they? Gee, I wonder why. This is the best solution, because the less the CEO’s are paid to and extent, the more stock dividends get paid to shareholders. Finding a balance might be a bit of a challenge, but then I’m sure the compensation for these financial leaders would be somewhat more tamped down. Yes but if Simon Johnson wants bankers to be bankers why does he not tell the regulators to get out of the business of managing risk and start regulating. It is the regulators who allowed the banks to leverage excessively… not the market. The market will for instance only allow hedge funds to leverage to about 10 to 1. 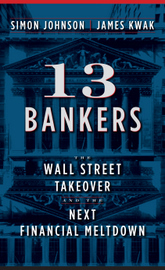 It was the authorized extreme leverage of banks that produced the extreme profits that produced the extreme bonuses. Simon Johnson would like the bankers not to use those leveraging opportunities given to them… and I just don´t simply trust the bankers being capable of resisting the temptations as much as Simon Johnson seems to do!!! You know, maybe the whole economic theory that shareholders know what they are doing needs to be examined. Don’t get me wrong – I own stocks. But really, the people at the top who know the intricacies of the system, both legally and financially, are going to share the gain with somebody like me? The fact that we have a model of economically rational man that says shareholders are constantly evaluating management is one view. But maybe some are more rational, and know how to manipulate the shareholders, and how to skew compensation packages in profound but subtile ways. How is it that the owners (shareholders) ended up losing money, and employees (CEO’s) ended up getting paid so much??? Some of them are out, and some arn’t. Bankers that is. If your information, or even lack of it, is wrong, the from that point, your point of view ie: (premise) can be up to one eighty from the facts. So if you team up with a bad regulator, you can be 1/2 at fault for not having or knowing the actual facts -vs- the percieved facts. All kind o troubles result from this problem, mostly after 5 pm during the week. And I echo your concerns, and ask myself just how far does one or can, or even would one want to go once given the option. Just take the animals, like Noah, to the farm and do your job, possibly with the new world doing its thing along side, but quietly indeed. The only other option is to have choas tire itself out and operate between the wars. I want to be ready for both asap, but that’s just me, and I know the time has not yet come for Noah. For me, a Wall Street outsider, it has remained inconceivable that executives in charge of companies that required a massive federal bailout to save their companies and sector would be rewarded with astronomical compensation worthy of really smart leaders. People who use the “stupid” defense to support their terrible business practices should be fired, not rewarded. It was their job to fully understand the business landscape they operated in. If they couldn’t handle the job – and it appears that most could not – well then Buh-Bye! Agreed, well said. There were no innocents among intermediaries, issuers, policymakers, regulators, and investors. They either weren’t paying attention or did not know what they were doing. For markets to work stakeholder rights have to proportionate to stakeholder responsibilities. You are overly generous by a factor of approximately 30%. is from British author G.K. Chesterton (1874-1936). Now for what I believe to be of some importance is the premise that we live in a multifaceted, integrated economy that requires reflexive market-government analyses. Whenever one group’s analysis exclusively uses either market or government, it creates errors of conflation (treating different components as though they were the same). You cannot use monolithic metrics to govern a multifaceted economy. This is my trouble with the one-size-fits-all TBTF approach advocated by Dr. Johnson and others. TBTF becomes TRTR as it conflates risk and uncertainty. As mentioned earlier by way of illustration and to get away from the inside baseball jargon, let’s change Dr. Johnson from a Ph.D. to an MD. If MD Johnson found a tumor in your breast, would you care to know more about the size (i.e. scale) of the tumor or (1) whether the tumor was malignant (risk), and (2) if malignant whether the tumor had metastasized (uncertainty)? Treating the tumor with a deterministic, one-size-fits-all metric (mastectomy) is far from medical best-practice. Since when (time frame?) Mr. old fashion banker has this been the “Norm” (Negative Operational Reversal Mode)? Last I looked the “Board of Directors” (BOD’s) of today’s, “everything’s money world” – are all past or present CEO’s, which kinda in itself is a conflict of interest. Think about what you said for just a millisecond? As an example/analogy: when your left hand won’t scratch your right buttocks without the hand of your [?] co-conspirator…what’s one to do? For collusion’s sake get on with it man…eh? Bring back a salary, and a tangible bonus or hugely discounted stock options (currently only for the chosen – and certainly not for the drones? ), “but”, can`not be exercised without full disclosure to shareholder’s at public meeting, “and have a exercise date/years” into the future…not in nanoseconds! Anybody here remember Mr. Nardelli? One of the three amigo’s…known as Jack Welsh’s (GE’s) captains too become the preeminent next leader of the world’s best run multinational’s. We all know he (Welsh) chose Mr. Emmelt who has failed miserably! But has a seat at the NYSE & FRB to bail him out? The other fellow went to “3-M” and was/is quite successful, but it is Mr. Nardelli the almost would be successor to Welsh that went to “Home Depot”. Why am I mentioning this ? There’s a distinct and functional correlation posited here – in three short years of a five year year contract Mr. Nardelli basically on his own almost/ could have bankrupted one of the most successful companies in the country and was handed/ rewarded a $243ml let-go (golden parachute – it’s time to bring the hammer down folks?) bonus! This is what’s wrong with America – approximately one/quarter billion dollars for trashing your (shareholders) company!!! Banks, Etc….and BOD’s without transparency will go on forever unless people are brought to justice! Stephen, TBTF limitation isn’t the complete answer for systemic risk. I don’t see a downside to TBTF limitation, but do see two clear upsides. An individual collapse would be smaller making trigger of a system wide collapse potentially less likely. More importantly, TBTF firms have a market advantage in access to capital and less aversion to risk because everyone knows they will be bailed out. Access to capital is one way to measure if a firm is getting too big. Markets are complex adaptive systems. If there is complexity, there is uncertainty. How do you propose to govern deterministic risk and indeterminate uncertainty with OSFA metrics in a TBTF regime? Like the metastasized cancer cell, uncertain financial products are unmeasurable and unbounded (e.g. Google founders stock). Conversely, MBSes comprised of no-money down, NINJA loans that are marked-to-model are uncertain securities. Would you rate an uncertain MBS investment as AAA with such downside? I argue that it is randomness not scale that is the independent governance variable. @Stephen Boyko: Let’s get back to the dismal science. Does this mean you support a return to Glass-Steagall? I am proposing a different governance model that focuses on randomness (not scale) based on predictable, risky, and uncertain economic regimes to provide the foundation for the different banking model that you seek. Just because you argue something is good, doesn’t mean something else should be tossed aside. I made a couple of points for paying attention to limiting TBTF firms. I’d be happy to have you refute those points. Perhaps, I would learn something. Forgive my inability to follow your argument, but none of your points seem to have anything to do with randomness. I don’t see how uncertainty and risk are necessarily random. I’ve always thought of randomness as indeterminate variance of a variable and not a variable in of itself. Perhaps our dialogue can advance the governance ball for the capital market. Preparatory to going point by point, it would be helpful to me if you would select one of the three following alternatives that best describe your view. If none conform, please provide your own description. It will help me respond with greater specificity. • First, is the capital market OK as is? • Second, is the market inefficient indicating that reform is a matter of degree to know what to do better? • Lastly, is the capital market ineffective (broke) needing fundamental restructuring in a matter of knowing what to do differently? Annie – And boy oh boy was it ever TOO easy with unlimited access to everyone’s financial records thanks to the Patriot Act. Annie – And here is the spark you can BANK on that is going to lead to a JUST WAR in the USA – they took away the rule of law – go claw through dusty history books – how long do such psychotics “rule” as a credible “government”…? Wonder if the Egyptian revolution will “change” their standard, “holy”, cultural female mutilation practices…? well, seems we are heading towards cultural mutilation. was the END of USA “freedom” and intelligence. The fact that all 5 of my female friends are minus our entire life savings and equity in real estate and stocks handed down from Grandmas who worked in factories making electrical sockets for residential housing that became “Verizon” and THAT bubble was the least visible one coming – we lost 2.5 million as a group of 5 – doctor, engineer, scientist, teacher, and HOUSEWIFE. You get to be above the law, we get to be LAWLESS. Frank Rich tells us about other pieces of the puzzle: http://nyti.ms/1NIp and makes an apt comparison between Madoff’s Ponzi scheme and the scheme run by the banks. CEO´s are so high pitched that they are scared to look down… and all yes-men wall (paper) are like railing not to fell down (again). Don´t worry you won’t see them again they are well hidden behind the palm tree and beautiful white sand… We are making a new bank system already. Haven´t you notice? What if we stepped back and looked at all of this from a different perspective for a minute. For instance, let’s assume that these guys masterfully manipulated the market on purpose and with the full intention of making it crash and stealing a bunch of money in the process. Now – there’s only so much “REAL” money in the system at any given time. And much of it is actually in retirement accounts – accounts where people have been trained over decades to take the long view on but otherwise keep their hands and attention off of. What if hedge fund investors and bankers saw this as an opportunity to tilt the balance in order to slide all of that REAL money right into their pockets? Would it be so hard to believe that this was the strategy all along? I’ve read article after article on this subject and cannot, for the life of me understand why nobody’s taken the leap to realize that this may all have been a run on retirement money that all of us have been trained to ignore – a giant coffer of unguarded cash. If this were the case, the plan worked perfectly and went off without a hitch. Because if we haven’t learned what their true intentions were to begin with – i.e. stealing all of the country’s retirement assets – then they’ve just pulled off the caper of the century. And that in mind, what’s to stop them from doing it again in another 5-10 years? It’s not as if we’ve been de-programmed to manage our retirement assets differently. In fact, T.Rowe Price and other retirement investment companies are telling their investors even now not to try and navigate bubbles themselves – that it’s the company’s job to do this for their investors since it has the tools, experience, and manpower that we obviously do not. But why trust companies that have already missed two bubbles in the last decade alone. There’s nothing whatsoever to convince the small retirement investor that they’ll catch and correct for these anomalies in the future. To justify their position they try to show how the market “always” corrects itself and inevitably returns money to back to the investor. But the reality is that it didn’t this time. We lost a decade’s worth of growth, and it would have been better to simply have our money in a savings account where the market couldn’t access it at all. My take on all of this? It’s not hard to see when a bubble is forming and growing. All one need do is ask themselves a simple question – “Does all of this behavior look highly irrational or not?” And if it does – pull your money out. I don’t think that the retirement investor even needs to be particularly accurate about when they pull out – just that he/she does it as soon as the question can be answered with a “Yes”. And that’s what I plan to do differently from now on. If I lose a couple years of growth because I’m out during an irrational growth period, so be it – at least I won’t be part of the crash. And when the dust settles – even if it takes years to hit bottom – I’ll wait and then put back in for a while until the next irrationally exuberant period begins to explode. All in all – I think the period of blind-eyed double-digit growth gains on retirement assets are over. And I honestly believe that if you can make even a constant 5% in the future you’ll be doing good. Why? Because there are forces out there that are going to want to steal your REAL, hard earned, retirement money once every 5-10 years and they’ll manipulate market forces in any way they can in order to do it… at least until we finally catch on and do something about it to stop them. 1. TBTF limitation isn’t the complete answer for systemic risk. Simply put, TBTF as the independent criterion for one-size-fits-all regulation does not represent best practice since it is not as accurate or as robust as Too-Random-To Regulate (TRTR). TBTF does not recognize “uncertain” (unknown, unknowns) investments as to cash flow and valuations that are marked-to-model (see Jubin, http://readingthemarkets.blogspot.com/2009/10/boyko-were-all-screwed.html.). The problem lies in determining what is “Too Big” as every boom and bust cycle engineers vapor assets that erroneously go into determining “Too Big.” Throwing a bone to Kurowski’s cause, it was the regulators who allowed many financial institutions to merge into TBTF status. Recall the S&L meltdown, where the indeterminate “asset” on the books of many insolvent S&Ls was “regulatory goodwill” – the regulator’s reward for acquiring an even more insolvent thrift. Who could have foreseen the Resolution Trust Corporation’s (RTC) liquidations that occurred when minimum reserve requirements became illusory in a setting where capital consisted of vapor assets? (Boyko, “Mr. Volker is wrong!” http://www.yorktownpatriot.com/article_659.shtml ). It is estimated that the subprime debacle had $8 trillion in vapor assets. How would such untenable assumption comport with the effectiveness of TBTF? 2. More importantly, TBTF firms have a market advantage in access to capital and less aversion to risk because everyone knows they will be bailed out. Access to capital is one way to measure if a firm is getting too big. Not necessarily, as Gresham’s Law explains that bad creditors (Government and GSEs) with bad money (look at dollar chart) drives out good creditors and money (e.g. current hoarding of capital). 2a. An individual collapse would be smaller making trigger of a system wide collapse potentially less likely. Once again, not necessarily as “uncertainty” is defined as unmeasurable and unbounded. There are approximately 8-10 trillion cells in our body, some are cancerous with the capacity to metastasize. Uncertain assets have a similar capacity to create non-linear responses. Conclusion: Just because you argue something is good, doesn’t mean something else should be tossed aside. An effective and efficient way to scale TBTF is through the concept of randomness where the “indeterminate variance (estimated $8 trillion haircut in assets valuation) of the capital market governance variable consists of predictable, risky, and uncertain regimes. But no! The regulators arrogantly thought they could through their risk-weight go ahead and play the risk-managers for the whole world… and they still do. With their 20% risk-weight which reduced the required 8 percent capital to only 1.6 percent they allowed the bank to leverage their capital in many operations 62.5 to 1 and that is, as any outside observer could see the mother of all growth hormones for the TBTF banks. Regardless of percentage requirement, what happens if the capital base becomes suspect (uncertain) as was the case in the S&L crisis? I tend to agree with the majority of what you say, but it is a matter of sequence and timing. You have to argue effectiveness before you argue efficiency. Indeed, but if you head off in the wrong direction it won’t matter how perfect your sequencing and timings is. As many commenters have pointed out, Bhagat and Bolton’s (and Johnson’s) interpretation of the ratio of sales to purchases is transparently foolish. When bank CEOs have a huge and on-going in-flow of their company stock forming the vast majority of their compensation (as they did and do), of course they are going to be selling when they can, and would be out of their minds to be buying any more stock, no matter how much they believed in their company. In other words, if I’m reading this somewhat murky comment correctly, they lost between three quarters and four fifths of the wealth (cash proceeds + stock value) they thought they had accumulated in the eight years prior to the crisis…surely the eight years that were almost entirely responsible for their very substantial net worth. This is a very odd sort of knavery indeed that these CEOs seem to have engineered. Of course, we should all be as unfortunate as these CEOs. However, I know this interpretation will seem odd to some of you, but these numbers seem to indicate that the financial incentives of bank CEOs were already strongly aligned with their companies before the crisis. Of course, if aligning interests didn’t succeed in avoiding that crisis, we could always insist on more, as the authors suggest and Johnson seems to approve. The finding reminds me of Enron’s collapse. The interests of Enron management were so much aligned with its stock price that the management made every effort including misdeeds to increase the price. The one who is able to detect mispricing of the stock is its management who more than anybody has insider information. Everybody now has to admit that stock markets are not always rational or efficient. It is inevitable that aligning management incentive heavily with its stock price without any transaction restriction sometimes causes managers to mismanage the corporations. It is difficult but well balanced corporate governance system should be established. It is interesting to watch everyone’s theoretical sparring about how to “fix” the system. Dancing with the foxes is an eternally losing battle. the fruits of the public’s labors. They should not, ever, make obscene amounts of money producing nothing of value. And, they don’t! “Fix the system” is usually interpreted as trying to stop banks from failing… and that is why the regulators get into risk management and assign their risk-weights. For me a bank is there to do his job of intermediation and not just to avoid failure; and so for me fixing the system means making banks fail swifter and more painlessly for the taxpayer. “and this is exactly how Jamie Dimon painted “His” aphorism thorny rose scenario for the government’s forcing of their (JPMC) hands to takeover Bear Stearns, and WaMu rather than what Dimon says should have been left to fail in bankruptcy where they were already on the cusp”? Gibberish, made-to-order “Bank Speak”, modified by usurping certain Treasuries fraudulent linguistics cohorts, dated by just-in-time absurdities per usual! Force the banks to stay *clearly* inside the lines. Very true… but then the rest of the world might fail. Why should banks lend to your business? Just because you say it is triple-A rated? I want the banks in general to be secure, safe and sound… but I want them also to take the risks they are supposed to take… and help finance the creation of jobs, not just to avoid the risk and drown themselves were regulators perceive it no to be risky… as the triple-A rated waters. “God make us daring!” … that is a prayer that the members of the Basel Committee do not even begin to understand the need for… Don´t you see that it was precisely by trying to avoid risks that they tempted banks to finance excessively what they should not finance excessively? How do you think the world has prospered… by asking their banks to avoid risks? Ha! thing called double entry bookkeeping and 1+2=3. Way inside the lines = Always lend money. Little bit outside the lines = Usually lend money. Risky loan = Loan X percent of time. in the risky loan category. No bail outs. too often in the risky categories, pull their charter. What’s the problem? thousands of pages of find-the-loophole game in new regulations, what’s the point of all this? I can tell you the *guaranteed* outcome: banks are going to fail — and big time. I will take that bet. And, probably, knock us all back to the stone age. Then, we’ll start over. And that was precisely what the Basel Committee thought they were doing… and in fact the 8 percent capital has been more than sufficient to cover for the risks of the “risky” loan category, like loans to small business and entrepreneurs… what went very wrong, as is always the case, was that the little capital set aside according to the requirements of the regulators we wiped out in seconds when the not risky turn out to be very risky. Any regulations were the regulators act as if they know what is risky and what is not, are bound to make the systemic risks of banking worse. Markets are complex adaptive systems. Where there is complexity, there is uncertainty (unknown cash flow, and unknown valuations that are marked-to-model)? One-size-fits-all (deterministic risk) metrics enables uncertainty to be priced at a risk premium leading to boom-bust bubbles. Risk management is as ill-equipped to deal with uncertainty as the Maginot Line was ill-equipped to deal with the blitzkrieg. What are your brightlines to demarcate the “risky” from the “very risky” domains? “Markets are complex adaptive systems…” I’m sure it’s much too complicated for my pretty little head…. The risky, though risky for an individual, is not risky for the society, as risk-takers are in clear minority. The not-risky on the other hand is “very risky” for society, because it is attractive to so many, especially when paying a fraction more than what it´s supposedly not risky nature justifies. When at the World Bank (2002-2004) and thereafter, time after time I tried to warn saying “you have to follow the triple-As to know where the next disaster awaits”. I was not thinking about WB. The path for an issuer who is risky because he is not perceived as risky graduating into being a very risky issuer, is normally the function of him offering returns in excess of what he would ordinarily have to offer for the type of low risk he seemingly represent. Then is Google an example of a very risky stock? To avoid very risky investments, does an investor sell his black swans? @Stephen A. Boyko I was not referring to stocks but to loans and bonds of rated clients. Do they offer to pay more than their rating seems to justify? If they do then that is as big as warning signs you can have and should take all the precautions. SAB: Both are assets categories for determining capital compliance and for determining TBTF scale. SAB: This is a subjective determination—as is “risky” from “very risky” to how many “VERYs” you need to preface a randomness descriptor before you get a financial Surgeon General’s toxic warning to purchase at your own peril. Statements in reliance of “safe” or “cheap” are relative. For financial institutions to operate in the safe manner that you seek requires understandable regulations with objective quantifiable standards. Subjectivity by and large is unenforceable. Much like the standards for driving where it is a crime for a driver to operate a vehicle while impaired by the effects of alcohol. The specific offense is called driving under the influence (DUI) with a measurable blood alcohol content of .6 percent versus driving while intoxicated (DWI) with a measurable blood alcohol content of .8 percent (BAC may differ in different states). Cutting to the chase, reference the binary brightlines of cash flow that is either negative or positive and valuation that is either marked-to-market or marked-to-model. Thus if a financial instrument has positive cash flow with a marked-to-market valuation, this asset value is predictable. If a financial instrument lacks either positive cash flow or a marked-to-market valuation, the instrument is risky. If a financial instrument has negative cash flow with a marked-to-model valuation, it is uncertain. This approach is consistent with FASB 157. Predictable and risky domains are determinate, whereas an uncertain domain is indeterminate. One-size-fits-all, deterministic governance of a multi-faceted domain creates errors of conflation (risk and uncertainty) that produce unsatisfactory results of larger and more frequent bubbles. Blaming either the “banksters” or the “regulators” in the absences of objective quantifiable brightlines merely reflects your biases and detracts from your points of value. Yeah yeah! Like as if all those triple-A rated MBS securities were so predictable. You can blame both if you like, but I keep blaming the regulators first, without any hesitation, because they, with their risk-weights, set ground zero for all the rest to act from. You make my point, no-money down, NINJA mortgages were packaged in negative cash flow MBSs (securities that banks held) that were valued on a mark-to-model basis. If these were categorized as uncertain, would they have received AAA-rating? Absent being bailed out by market appreciation, such MBSs were a “Minsky moment” waiting to happen. It was the regulators, in support a one-size-fits-all deterministic regime, who allowed many financial institutions to merge into TBTF status. Recall the S&L meltdown, where the indeterminate “asset” on the books of many insolvent S&Ls was “regulatory goodwill” – the regulator’s reward for acquiring an even more insolvent thrift. It is estimated that the subprime debacle had $8 trillion in vapor assets. How does such untenable assumption comport with the effectiveness of TBTF? A more effective and efficient way to scale TBTF is through the concept of randomness—the systemic variance due to incomplete, noncorrelative information where capital market governance consists of predictable, risky, and uncertain regimes.